The government’s new BB93 – Acoustic Design Standards for Schools, was launched just prior to Christmas! Shane Cryer of Saint-Gobain Ecophon, in conjunction with SCALA (Society for Construction and Architecture in Local Authorities) has arranged a series of roadshows atinteresting education projects around the UK, to explain the changes. The first visit took place in Denbigh, at the striking Denbigh Welsh speaking primary school, YsgolTwm O’ R Nant. 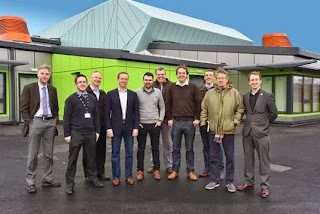 It was designed in-house at Denbighshire County Council, built by Wynne Construction (Richard Partington, 3rd from left) with the acoustic installation by M G Ceilings (Craig Russel, 3rd from right). David Whieldon, the project architect at Denbighshire County Council provided the concept:“YsgolTwmo’r Nant is a Welsh medium primary school in Denbigh, North Wales. ‘Ysgol’ means school and Twmo’r Nant was the pen name of Welsh dramatist and poet Thomas Edwards who plied his trade locally in the 18th Century. Demand for Welsh medium education is still strong in Denbighshire and it was determined that YsgolTwmo’r Nant need to be refurbished and extended to meet the demands of BB99 for a school with 280 full time pupils. 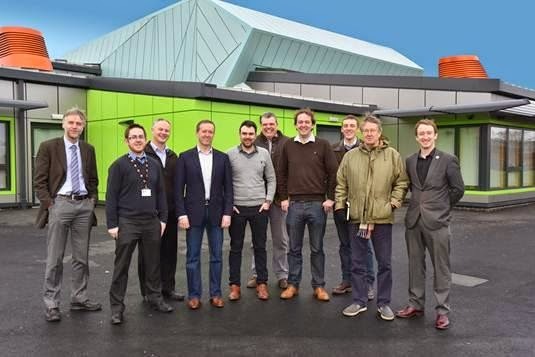 “There was a very effective collaboration of ideas and solutions, involving all parties, including Denbighshire CC, ourselves, M G Ceilings (our subcontractor) and Ecophon, to ensure that the high quality of finish and specification was achieved”. MACH Acoustics’ Ze Nunes will feature in “Local Authority Building & Maintenance” as they intend to lead with it in their annual “schools transition” edition in March! With shrinking budgets, primary school halls are almost always multi-use. It is therefore no longer acceptable to design them with long reverberation times.The standards for sports halls have changed; guidance notes to follow (from the Association of Noise Consultants) will give further instruction regarding the positioning of acoustic absorbers to eliminate flutter echo. In MACH Acoustics view, BB93 2014 is a significant improvement over the old BB93, providing clearer and possibly more appropriate performance standards. However at this stage, we do not see the need to relax the reverberation (RT) times in refurbished buildings, since the Essex Study has shown clear evidence of the benefits of reducing RT. Sports Halls are challenging spaces to design and therefore a clear and detailed calculation process must be provided, to ensure the on-site performance of these spaces. Finally, with regards to noise ingress, we see that the proposed maximum 55 dBA noise ingress level for the 200 hottest hours of the year, could be considered as too lenient, and could result in complaints as a result of communication challenges. We also feel the statement relating to the acoustic performance of single sided vented facades and façades to cross vented spaces at 16 and 20 dB could be a little too simplistic.